Set your hourly rate(s) based on your level of experience. This is a great way to get started. 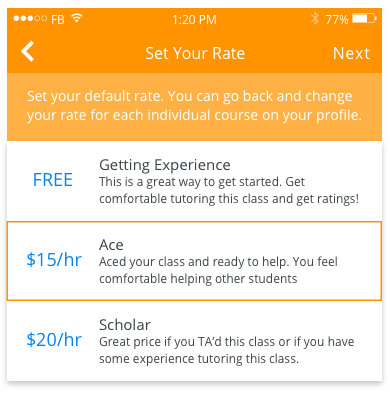 Get comfortable tutoring the class and build your ratings/reviews. You aced your class and you're ready to help! You feel comfortable and confident helping students. Great price if you've TA'd this class previously or if you have some experience tutoring this class. You are very comfortable tutoring this class and have tutored many students. You are a very strong tutor in this course and have extensive tutoring experience. CUSTOM - You can always set a rate that is in between or above these price tiers. Keep in mind that, with all else equal, lower prices tend to mean more requests, while higher prices may result in fewer. So, if you are charging higher rates, make sure you convey your proficiency in your profile bio. Use our guide to help! 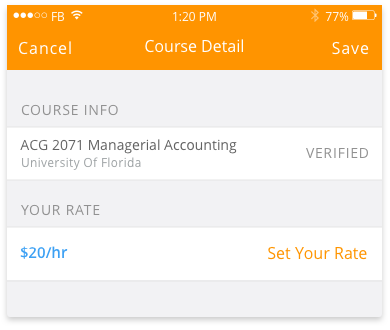 After you submit your transcript, you will be prompted to set your hourly rate. 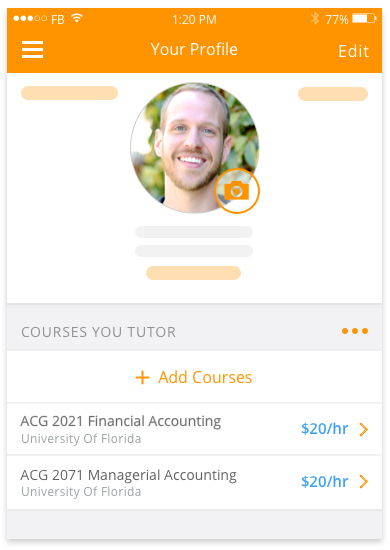 You can set the same rate for all of the subjects or courses that you tutor (this will happen by default) or choose different rates, depending on your level of proficiency in each course. Change the rate of an individual subject or course under "Courses" in the menu. Modify the rate by clicking "Set Your Rate."